Waterproof watches didn't really arrive on scene until the 1950's. Some of the WWII military watches started the trend, thanks to gaskets in the stem tube and under the back cover. Then later in the 1940's the CLD models introduced gaskets around crystals too. Hamilton tried a lot of different approaches to sealing watches and they marketed them as "weatherproof" and added an asterisk with the caveat that seals and gaskets needed to be intact. One of the models with an unusual case design is the 1959 Sea-Cap. It was produced for three years. 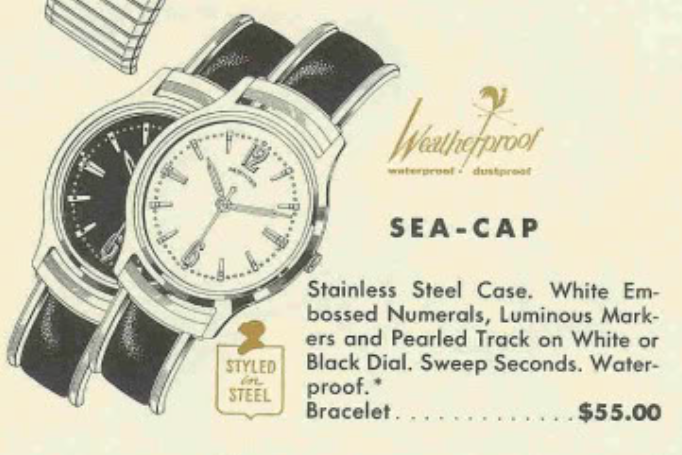 The Sea-Cap came in a two-piece stainless steel case on a matching bracelet. In 1959 the bracelet had a leather insert. However, for the final two years of production the bracelet was changed. In the 1961 catalog, the model was "sold out". 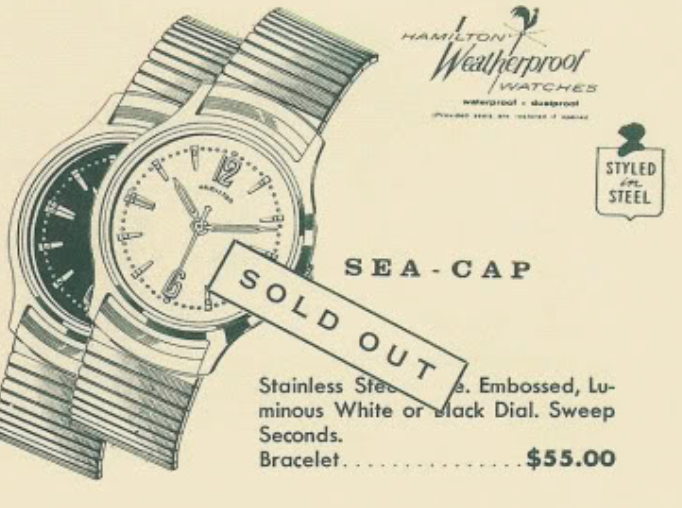 The Sea-Cap came with a white or black dial. The numerals on the dial are a very unique font, unlike any other models that I'm familiar with. Under the dial you will find a Swiss-made Hamilton 671 movement based on an ETA grade. It looks a lot like a manual version of the 672 Automatic, but without the rotor. I recently received a black-dialed project watch and it was in decent enough shape but the dial has turned a deep brown over the passage of time. There's a lot dust inside and there's a bit of a rattle inside from the movement and dial being a little loose. I really don't like the design of the Sea-Cap case and I don't think the designers did either, as there aren't that many models that use this style of case... maybe only the Sea-Cap, in fact. The back snaps on and off but it can be very finicky to close. One of the reasons the case is finicky is it has a wide gasket that goes over the case back. It also has a two-piece stem, so it's a little reminiscent of the CLD models like the 1953 Croydon. Once the movement is lifted out of the way, you might think this model was called the Stainless Steel, as the case material is marked similar to where the model name is often stamped. The 671 movement is fairly clean but actually has a feel of sticky grime to it. Everything is cleaned and dried. I'll take the time to relume the dial and hands since the existing lume came off in the cleaner. Reassembling the movement is straightforward and just like a 672 but without the extra automatic framework added on the back. It's running nicely as well. The most challenging part of reassembling this watch is putting it back together without the movement and dial rattling. There's a reflector ring that goes on top of the dial and it should be held down by the crystal. I think the reflector ring on this watch may be a replacement and it's not quite right. I found that if I reinstalled it upside down it would hold the dial in place and another reflector ring on top of it sandwiches it all together. With a new crystal it now looks good and it no longer rattles. I paired it with a stainless steel mesh strap that goes nicely with it, in my opinion. I recently picked up a Sea-Cap that had only been identified as a "50's Hamilton". I took it apart to see the movement and try to identify the model, and then I had the same problem you described putting it back together! I like the look on the mesh strap - any recommendations on where to find one like that? Like all other things... eBay.